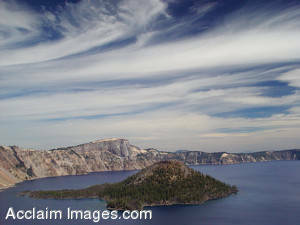 Description: Stock Photo of Crater Lake with Beautiful Clouds Filtering in. This photo also shows Wizard Island surrounded by the lake. You may purchased this photo as an art print or poster. It is also available to license as stock photography.